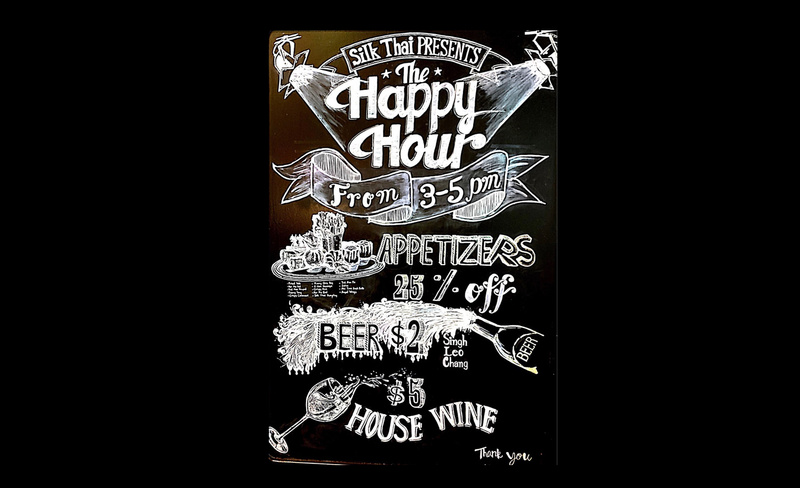 Silk Thai is The Fine Thai Cuisine, we make a difference and create serving concept a contemporary healthy Thai Food with home cooking style and maintaining the authentic flavor of Thai culinary in the clean and cozy atmosphere. We serve our special guests,the fresh food and drink enrich by complete nutrition values, the unique taste of individual dish would meet the needs for everyone, All natural ingredients have been carefully selected, the excellence quality is strictly controlled at all stages of cooking to maximize our guest health benefits. Thai cuisine is known for its balance of five fundamental flavors in each dish or the overall meal - hot (spicy), sour, sweet, salty and bitter (optional). Although popularly considered as a single cuisine, Thai food is really better described as four regional cuisines corresponding to the four main regions of the country: Northern, Northeastern (or E-san), Central and Southern. Southern curries, for example, tend to contain coconut milk and fresh turmeric, while northeastern dishes often include lime juice. Thai cuisine has been greatly influenced by its neighbors, especially India, China, Malaysia, Laos. Many dishes are in fact Chinese dishes adapted to local tastes. Instead of a single main course with side dishes found in Western cuisine, a Thai full meal typically consists of either a single dish or rice (khao) with many complementary dishes served concurrently. Rice is a staple component of Thai cuisine, as it is of most Asian cuisines. The highly prized, sweet-smelling jasmine rice is indigenous to Thailand. This naturally aromatic long-grained rice grows in abundance in the verdant patchwork of paddy fields that blanket Thailand's central plains. Steamed rice is accompanied by highly aromatic curries, stir-fries and other dishes, incorporating sometimes large quantities of chilies, lime juice and lemon grass. Curries, stir-fries and others may be poured onto the rice creating a single dish called “khao –rad- gang”, a popular meal when time is limited. Sticky rice" khao neow" is a unique variety of rice that contains an unusual balance of the starches present in all rice, causing it to cook up to a sticky texture. It is the daily bread of Laos and substitutes ordinary rice in rural Northern and Northeastern Thai cuisine, where Lao cultural influence is strong. Thai food is generally eaten with a fork and a spoon. Chopsticks are used rarely, primarily for the consumption of noodle soups. The fork, held in the left hand, is used to shovel food into the spoon. However, it is common practice for Thais and hill tribe peoples in the North and Northeast to eat sticky rice with their right hands by making it into balls that are dipped into side dishes and eaten. Often Thai food is served with a variety of spicy condiments to embolden dishes. This can range from dried chili pieces, or sliced chili peppers in rice vinegar, to a spicy chili sauce.